America's favorite beer-drinking cartoon character was at the center of a new Intel television ad in Fall 1998 titled "Homer's Smarter Brain". In the commercial, Homer's brain was replaced by an Intel Pentium II Processor. As a result of the transplant, Homer transformed from a low-level nuclear technician to become a college professor. 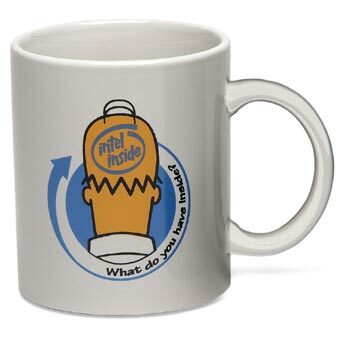 Along with the popular TV ad, the IntelStore also stocked Homer Simpson / Intel Inside logo merchandise during the Fall and Winter season of 1998. The Simpson's Campaign Ad replaced the popular Dancing Bunny People TV Commercials & Ads that ran from 1996 to 1998. The Homer Simpson ads were very short run Ads (months of November and December of 1998 only) and were eventually followed by the equally creative, Computer Generated "Aliens" Ads (Pentium 4 Processor in 2001) & The Blue Man Group Ads (Intel Pentium 3, Pentium 4 & Centrino Processors in 2000 to 2005). "Homer Simpson gets Intel gig"
Homer Simpson, doughnut-eating father figure on the television show The Simpsons, will become a spokesman for Intel. America's favorite beer-drinking cartoon character will be at the center of a new television ad that will tout the performance of the Pentium II processor. In the ad, titled "Homer's Smarter Brain," Homer's brain will be replaced by a Pentium II processor. As a result of the transplant, Homer will become a college professor. Currently, Homer works as a low-level nuclear technician. The goal of the new Intel spot is to educate consumers about the role and value of having an Intel processor inside their computer, the company said. "Homer Simpson is the perfect vehicle to communicate that having an Intel processor makes your computer smarter," said Joann O'Brien, Intel's Worldwide Consumer Advertising manager. "Not only is he entertaining to watch, but more importantly, consumers can understand the message--if an Intel chip can turn Homer Simpson into a scholar, imagine what it can do for your PC." The ad is part of an overall makeover for the chip giant's TV campaign. 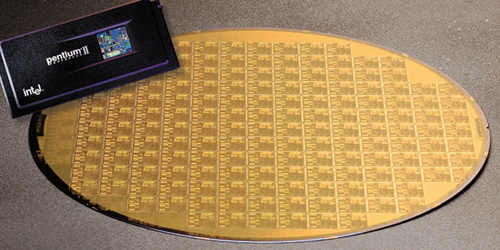 Until recently, Intel television ads centered around the "Bunny People", fabrication plant employees who wore brightly colored clean-room suits and danced to throbbing disco music. The campaign, which started with the Pentium MMX processor, ran for about two years. Intel quietly phased out the Bunny People TV campaign earlier this year. The 30-second Simpson commercial was created by Euro RSCG/DSW Partners and will debut during the season premiere of The X-Files on Sunday, November 8 on Fox. 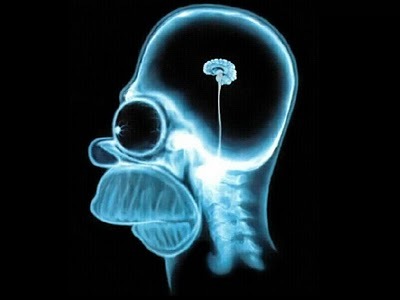 "Homer's Smarter Brain" is scheduled to run during prime time, late night, and sports programs until December 31. "Through this collaboration, the multi-generational appeal and freshness of The Simpsons is brought to an even higher level, furthering its penetration of the national psyche," noted Sabrina Ironside, executive director, Worldwide Television Promotions, Twentieth Century Fox Licensing and Merchandising. "Doh," Homer might himself add. White Ceramic mug with colorful Homer Simpson / Intel Inside screen printed graphics. New/Unused. 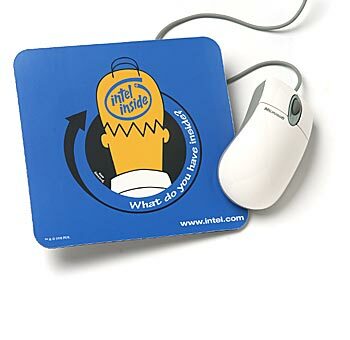 Intel blue Mouse pad with Homer Simpson / Intel Inside color graphics. 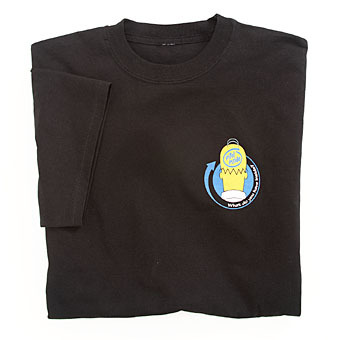 Black T-shirt with Homer Simpson / Intel Inside screen printed graphic. 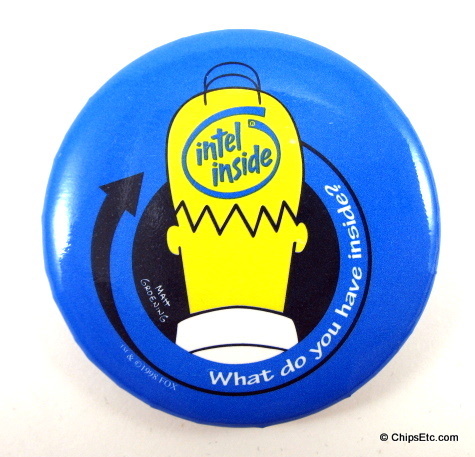 Intel blue metal pin-back with Homer Simpson / Intel Inside graphic. 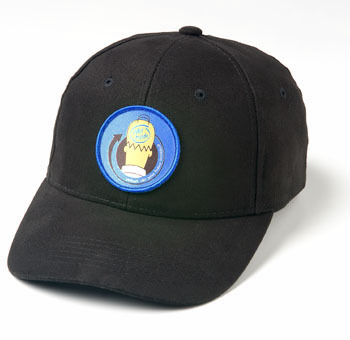 Black cap with Homer Simpson/ Intel Inside graphic.